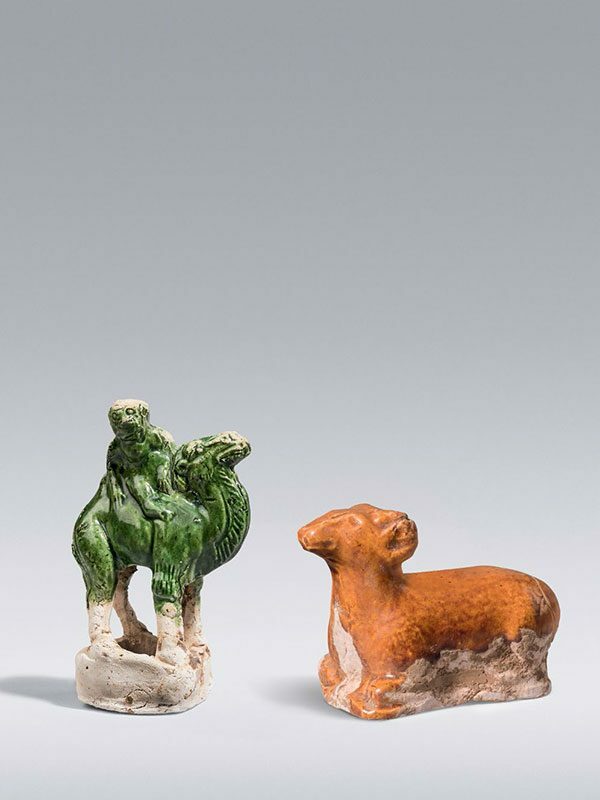 Two miniature pottery figures, one representing a seated ram, the other a camel with rider. The ram has its four limbs tucked underneath its body and a horned head looking straight ahead in alert position. The other figure depicts a rider seated on the back of a camel, his upper body turning towards his right. The camel stands still with its four legs separately modelled, its arched neck raised and its head looking straight ahead in an alert manner. The exterior of the ram is covered with a layer of lustrous amber glaze, stopping unevenly around the lower part of the body, revealing the fine buff pottery body. The camel and rider are covered with a layer of lustrous green glaze, also stopping unevenly around the lower part of the body and revealing the fine buff pottery body.